It has been extremely hot here recently, up to 45°C or 114°F (take your pick) this week. On top of that, we have gotten a dust cloud from Africa over Texas I am told. All this is to say, I haven’t been out to shoot a whole lot recently. 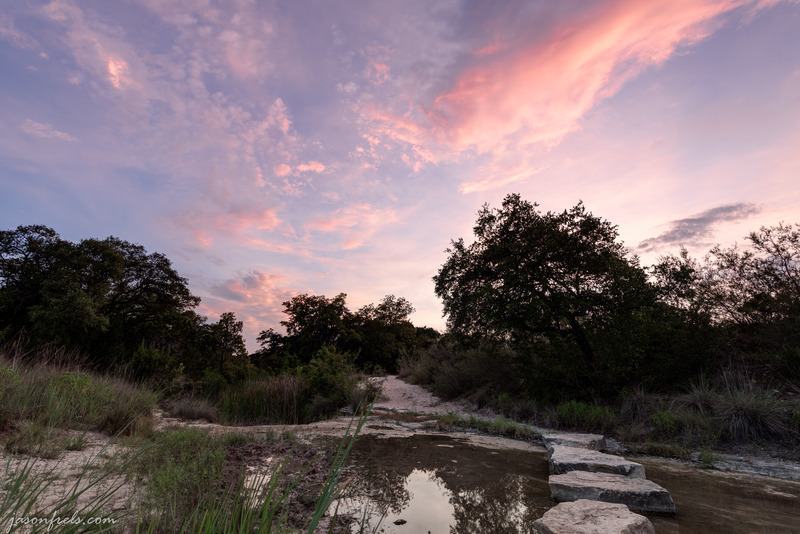 I did make myself go over to Balcones Canyonlands NWR after work one evening to find something as the sky looked promising and we got a break from the African dust cloud. I wandered around for a while, looking for a composition. I considered some gnarly old fence posts, but there wasn’t really anything to go with them to make them interesting. But, further along the main trail there is a stream with a path of stones across it. It wasn’t really flowing at this time due to the lack of rain, but there was still water in it. 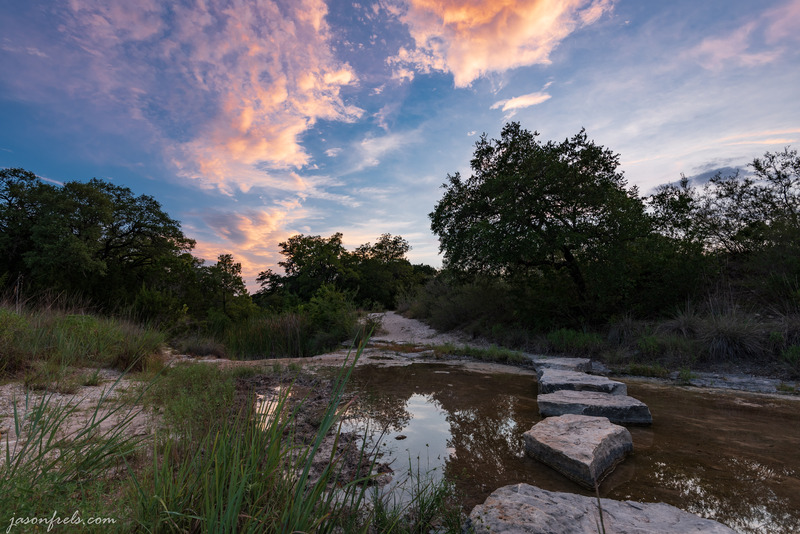 When I came to this point, I decided to get down low and try to do something with this path of stones across the stream and the sunset sky in the background. Below is one of my first shots. The idea is for the path of stones to lead your eye across the stream, up the path, and to the orange clouds in the sky. The orange clouds were lit fantastically, I think. I was concerned about getting the path and as much of the sky as possible. I was shooting at 16mm focal length, which is pretty wide, and I was down as low and close to the first stone as I could get. I did brighten up the exposure just a bit on the narrow path on the far side of the creek so that it wouldn’t get lost in the shadow. I just painted over this little bit of trail with an adjustment brush filter and bumped up the exposure a tiny bit. This photo turned out better than I expected, to tell the truth. I waited a bit longer, swatting the bugs, to see how the sky would develop as the sun set. Sometimes you get brilliant colors across the high clouds after the sun has set and sometimes it all just fades to gray. These clouds seemed high enough to catch a little bit of color, but there was a lot of haze on the horizon, so I didn’t know what I would get. It was a bit darker so I took brackets for an HDR merge, see image below. This image turned out OK, but not as good as the earlier photo. The clouds really lost their color in a hurry as the sun went down. This was an HDR merge of 3 photos, I believe. Merged using Photomatix Pro and Ligthroom. I thought that the texture of the clouds just above the trees on the horizon would really pop, but it didn’t work so well. Even though it is hot and unpleasant outside, sometimes I just have to get out and find something to shoot. I may come back to this path another time when there is more water in the creek. Leave a comment and let me know what you think. Thanks. Your photos make me want to visit these places. You can’t tell how hot it is, or how many bugs there are from the pictures, so what you’ve captured makes me yearn to take a long hike through there. Thank you for the kind words. I am always looking for another place to take a hike. Great images Jason. I like how you composed it and love the leading lines created by the path! I love sunset photos. I think these have really good composition; there is a great contrast between the sky and the trees, and the creek bed forms an interesting vanishing point. Thank you. I was hoping the trees weren’t to cluttered for the picture. I would really like to have a parent and small child walking up the trail in the distance, as if after a day of playing.